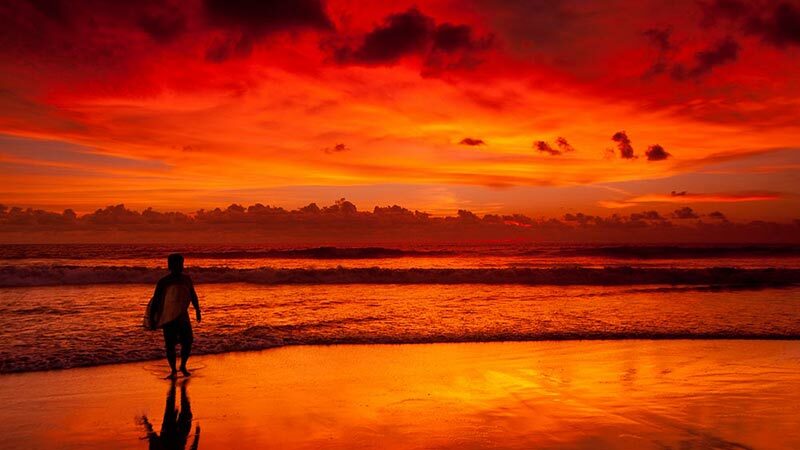 Kuta is known as a budget-friendly backpacking and party area. People who stay around Kuta area are mostly young travellers who spend their time surfing and partying. If you are interested in making new friends and losing a lot of sleep then Kuta is definitely the place for you. Here are my top picks for what to do and experience while you stay there. Kuta is an area that never sleeps. You can start your day chilling out by your hotel pool with a Bintang in hand and move on to eat and drink some more for example at Stakz on Jalan Benesari. When the evening arrives head out to Alleycats on Poppies 2 for cheap Bintangs, shots and double doubles (local version of vodka red bull) or Greenbox on Poppies 2, Gang Ronta or on Jalan Legian behind the Kuta bombings memorial monument for cheap cocktails and shots. 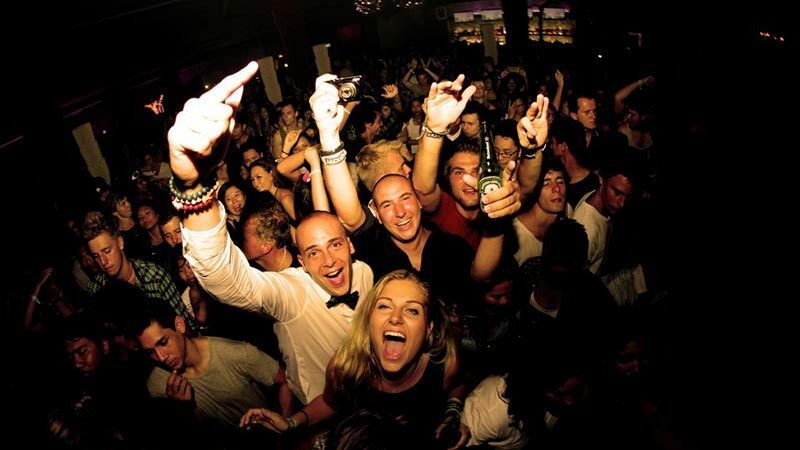 After midnight head out to the clubs on Jalan Legian; the best atmosphere can be found at either Eikon or Sky Garden. Entrance to Eikon is free but expect to pay around Rp.100 000 for entrance to Sky Garden at least on weekends. If you are more interested in just chilling out sit down at Gora steps on Poppies 2, buy some vodka and juice at the shop on top of the stairs and borrow their blender to create cocktails of your own and make some new acquaintances while you’re at it. Don’t come to Bali and not surf. 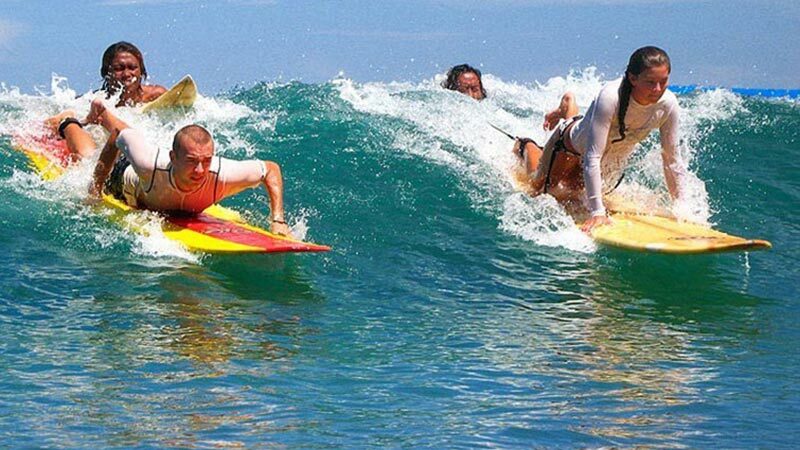 Kuta beach is the perfect place to learn how to do it. You can either book the lesson already from the many surf shops around Poppies area or head straight to the beach and approach one of the beach boys there. If you want to use a proper surf school I would recommend Pro Surf on Kuta beach road. Lessons with the locals will set you back around Rp.300 000-350 000 (2,5 hours), Pro Surf charges about double. If you wish to check out other spots, Double six beach in Seminyak and Batu Bolong in Canggu are also great for beginners. Cheap local stalls can be found anywhere in the area but unless you’re into bargaining and hope to find better quality, you can go check out the big Oleh-Oleh (Indonesian for gifts or souvenirs) stores located on Sunset Road. There you can find all things balinese without having to deal with the eager street-sellers. In case you are after certain labels check out Jalan Legian for surf brand shops (they have everything from Quiksilver to Billabong and Rip Curl) and nice clothes at Somewhere and Lost in Paradise, Kuta Square at the end of Jalan Legian for sports gear and Beachwalk mall on Kuta Beach Road for international brands like Pull&Bear, Stradivarius and TopShop. There are also plenty of outlets just outside of Kuta. There are three movie theaters to choose from in the Kuta area. 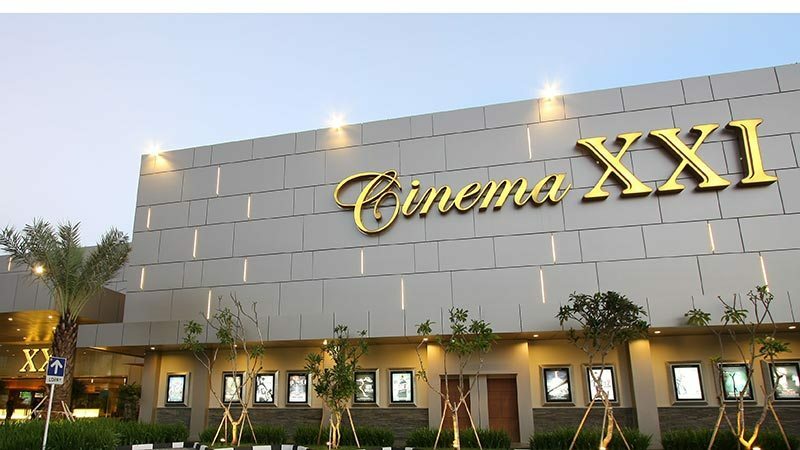 Galeria XXI is the oldest one, located at Mal Bali Galeria on Jalan Bypass Ngurah Rai and Beachwalk XXI is located inside the Beachwalk Mall on Kuta Beach Road. There are usually only a couple of movies to choose from but they premier not long after european premiers. Tickets cost Rp.50 000 Monday through Thursday, Rp. 60 000 on Fridays and Rp. 75 000 Saturday to Sunday. The cheapest option is Park 23 XXI where tickets cost Rp. 40 000 Monday through Thursday, Rp. 50 000 on Fridays and Rp. 60 000 Saturday to Sunday. 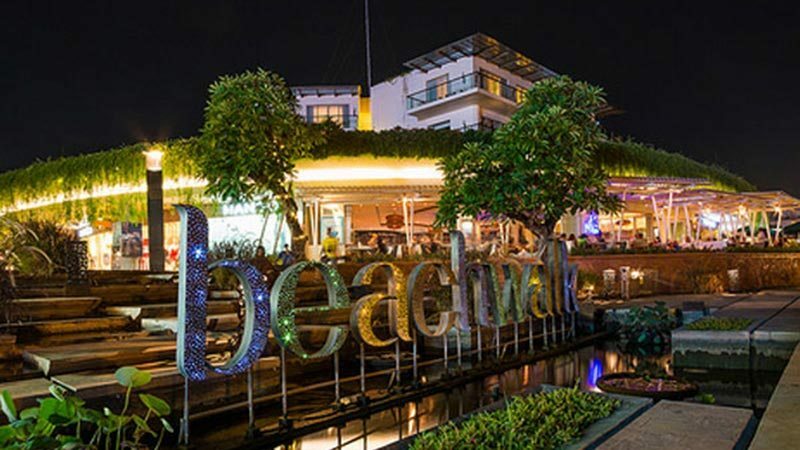 If you want to enjoy a luxury experience with comfy lounging chairs, book your ticket for the Beachwalk Premiere (Rp. 100 000 Monday through Thursday, Rp. 150 000 on Fridays and Rp. 200 000 Saturday to Sunday). Tickets should be purchased on site, so show up early enough. The movies shown can be checked at www.cineplex21.com, just remember to choose Denpasar as your city. 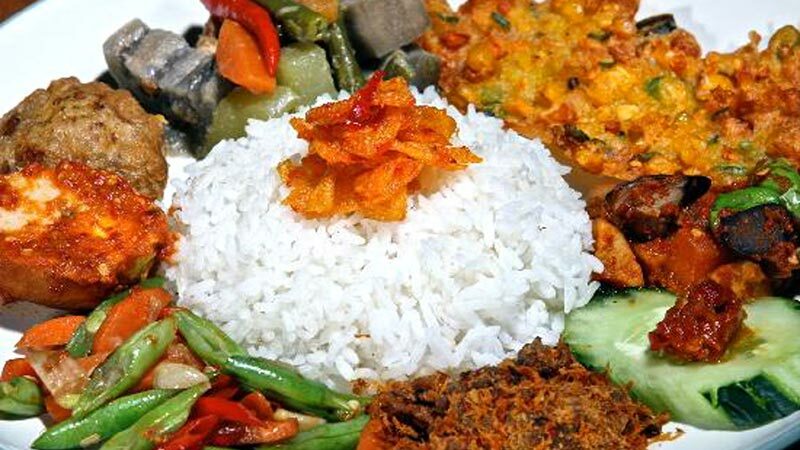 Kuta is a prime spot for good and cheap local food. Night market on Jalan Patimura has several stalls for good food and excellent fruit juices, Warung Malang on the same street serves amazing seafood and Warung Indonesia on Poppies 2, Gang Ronta is a heaven if you like Nasi Campur (this means mixed rice in indonesian), there are plenty of options to choose from. If you’d like to eat some western cuisine at an affordable price head out to Sky Garden rooftop buffet starting at 5pm every day. The selection is different each day; on one day it might be mexican and on the next seafood. You pay only Rp. 100 000 for all you can eat and drink (beer, Smirnoff Ice and some cocktails). For a gourmet feast visit www.jamieoliver.com/italian/indonesia. Jamie Oliver has recently opened his first restaurant in Bali adjacent to Hard Rock Hotel on Kuta Beach Road. His italian menu is inspired by tradition and offers original takes on rustic dishes. There are plenty of cheap spas around Kuta area. If you’re not satisfied with one just try another the next day. With these prices you can afford to have a treatment every day. Expect to pay around Rp.50-60 000 for a 1-hour balinese massage and around the same for foot massage, manicure or pedicure. One treatment that’s definitely also worth a try is cream bath: your hair will be washed and smothered with a hair mask. While you wait for the mask to absorb you’ll be pampered with a scalp, shoulder and arm massage. The treatment takes 45 minutes to 1 hour and will cost around Rp.60 000. Start your morning with a stroll on the beach while it’s starting to wake up for the day. You can join a local zumba class held on the beach (as far as I know it’s free of charge so go jump in, instructions are in indonesian but just mimic the others and you’ll do fine) or watch people riding horses. On a clear day sunsets are a pretty spectacular sight. Sit down at a beach bar (which usually means a couple of chairs, umbrellas and a cooler box where the drinks are kept) and enjoy a Bintang while watching surfers enjoy the last waves of the day with the sun setting on the horizon. And don’t be scared of the beach dogs, usually they are really friendly and up for some loving. 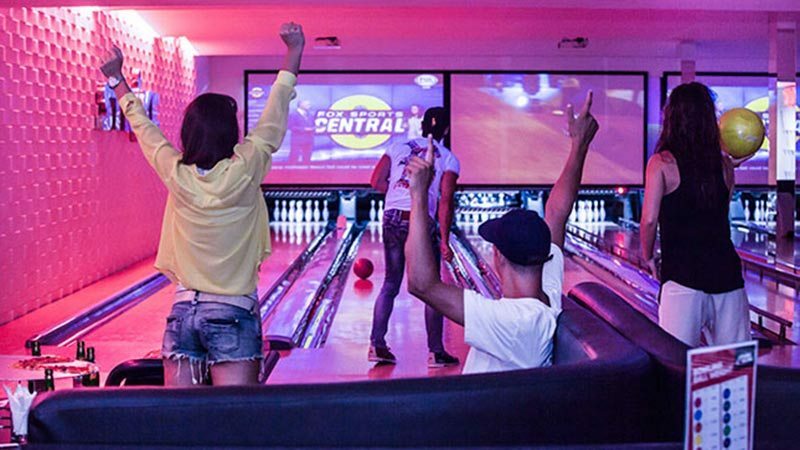 If you feel like having a fun night out with a group of friends but don’t feel like partying you should definitely try bowling at Paradiso Bowling & Billiards Centre on Jalan Kartika Plaza no8. They have 18 national-certified bowling lanes with computerized scoring systems, and also a DJ to play some background tunes. Just choose shoes and a ball to fit you and get your strike-face on. If you’re not so much into bowling you could play a couple of rounds of billiards instead. Plenty of food and drink stalls are to be found to keep your hunger and thirst at bay, and for kids there’s balloon bumper bowling and kiddie rides available. Kuta sea turtle conservation project helps to conserve the beautiful species of sea turtles. Their aim is to protect the eggs and increase hatching rates. The turtle rangers patrol the beach all night looking for mother turtles that come out of the ocean to lay their eggs on the beach. 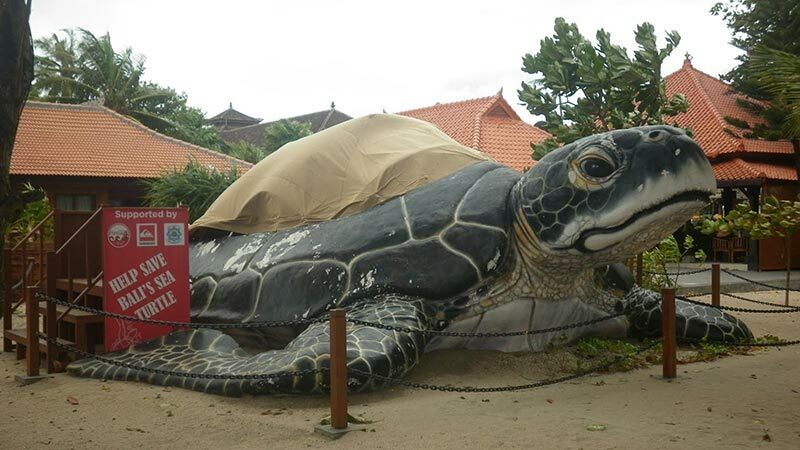 They protect the mother turtle during the nesting process and when she’s finished laying the eggs they relocate them from the beach to their hatchery in Kuta. When after 45-66 days the baby sea turtles hatch, the project returns them to their natural habitat quickly. You can join the baby turtle release by releasing your own baby turtle into the ocean from March to September. From June to August baby sea turtles are released into the ocean almost every day. Kuta is an area with lots of bars, shops and also tattoo studios. Prices are a lot cheaper compared to western countries, just keep in mind that the quality of work varies a lot. Don’t just walk in a shop and choose something from a book, instead look around and ask to see examples of the tattoo artists’ previous work. When you find someone with a style you like explain what kind of tattoo you want and get them to make a sketch of the design for you. Only when you are happy with what you see will you be happy with the end result as well. More renowned artists charge more but it will be worth the price. Make sure the studios only use needles once and they clean their gear with autoclave. 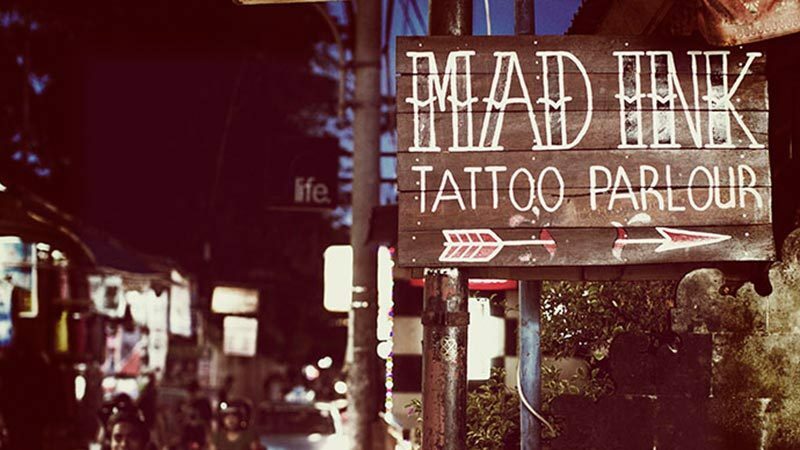 Check out Mad Ink Tattoo on Poppies 2, gang Tunjung Inn or Shotonk Tattoo on Jalan Majapahit no.63.